The Chromebook Pro and Plus are two beautiful laptops built with Android apps in mind. Late last year, I lamented that Google didn't make Chromebooks a priority over the holiday season. With Android apps and the Google Play Store coming to the platform, it seemed like a perfect time to push Chrome OS. As this morning's leak showed, I just needed to wait another month: Samsung and Google have just announced the Chromebook Plus and Chromebook Pro, a pair of laptops that strive to present the best Chrome OS experience a user can have. Let's get the difference between the two models out of the way early: The cheaper Chromebook Plus uses an ARM processor while the Chromebook Pro features an Intel Core M3 processor. Neither is the most powerful out there, but in my quick tests, the Chromebook Pro seemed plenty snappy. I will note that an ARM processor is probably never going to provide the best Chromebook experience one can have, but I'll grudgingly reserve judgement until really testing it out. But everything else about the two computers is the same. Both have 12.3-inch displays with 2,400 x 1,600 screen resolution (and the same 3:2 aspect ratio of the Chromebook Pixel). But instead of making everything super tiny, the display scales things down to 1,200 x 800 by default. Don't worry, though, everything is super crisp and clear. Fortunately if you need more real estate, there are plenty of options here. Four gigs of RAM and 32GB of internal storage round out the basic spec sheet, and battery life is rated at eight hours. As you might expect, the screen is a touchscreen, all the better to use Android apps. In fact, this is the first Chromebook that'll come with Google Play pre-installed. The Chromebook Plus is scheduled to launch first, in February, and the Play Store will still be in beta. But when the Pro launches later this spring, it will come out of beta running with full Android Nougat support. These laptops truly represent the coming-out party of Android apps on Chrome OS. The screen has another unique trick to the Chromebook space, as well -- it's the first screen to support a stylus. Samsung has a lot of experience with the stylus, and it comes to bear here. There's a slot on the side of the computer to tuck the stylus in, and when you want to start writing you can pop it out, Galaxy Note style. Indeed, the stylus is basically identical to what Samsung has offered on the Note series in recent years. To make for a better note-taking experience, the Chromebook Plus and Pro both can flip their screens all the way around and work as a tablet. I've always been a bit dubious of the reversible screen tablet form factor, but these Chromebooks are light enough to make it workable, if not the most comfortable experience. At 2.38 pounds, you're not going to want to hold this up for long, but putting it down on the desk to take notes is works just fine. Once you start taking notes, Google's newest contribution to Chrome OS becomes clear. The Google Keep app has been redesigned with handwriting in mind. Using the company's vast amount of machine learning data, it can analyze your notes and make them searchable, so your handwritten notes are just as easy to find as things you type out. Those notes sync back to the cloud and are available and searchable in the Keep mobile app for iOS and Android, as well. Google is also using its machine learning chops to improve handwriting recognition and latency when writing notes. By analyzing a huge sample of handwritten notes, the Keep app can predict what you're most likely to be writing based on the first few letters you start drawing. It sounds similar to the autocomplete word suggestions that the iOS and Android keyboards give users, but just tuned to work with handwriting. 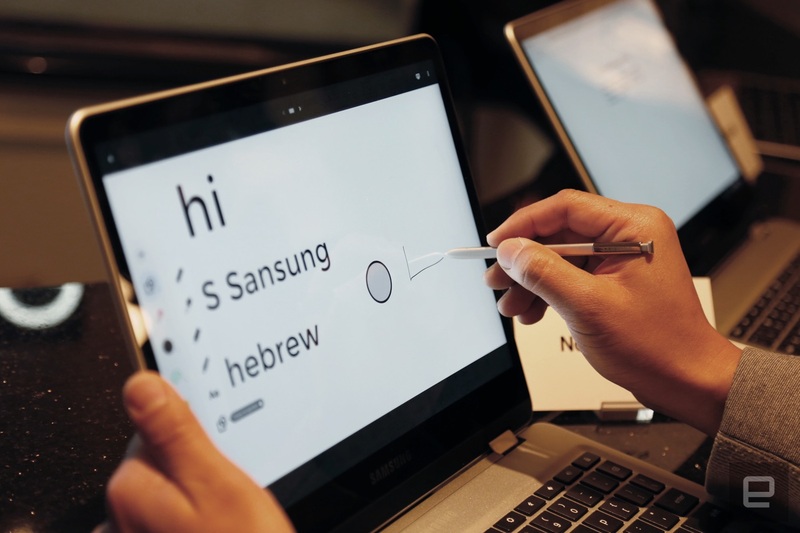 Google says that thanks to this machine-learning assist, the Samsung Chromebooks have less latency than the Surface Pro when writing words. We were able to try writing both with and without Google's assisted writing feature, and there was no question: It's much faster and more accurate to take notes with it on. It made my chicken-scratch writing look a bit clearer, and things just flowed out of the stylus much better -- but it didn't feel unnatural, like the software was getting ahead of what I was writing. From a physical, build-quality perspective, the Chromebook Plus and Pro are the nicest pair of Chromebooks that I've seen this side of the Pixel. The all-aluminum construction makes them feel solid and strong, and the keyboard and trackpad both felt good in the all-too-short time I spent with them. I'm used to using a 13-inch laptop, so everything felt a little small here, but it wasn't too jarring and I expect most people will adjust pretty quickly. Fortunately, the keyboard is basically full-size, so typing won't be compromised. As for ports, the Plus and Pro are going all-in on USB-C, for both charging and connectivity. There are only two on board, but that's pretty standard for most Chromebooks these days. There's also a microSD card slot and a headphone jack, and that's all you'll get. The last thing to know about the Chromebook Plus and Pro is that they won't come cheap. I wouldn't have expected them to either; the construction here is on par with $1,000 laptops, at least at first glance. The Plus starts at $449, and it's reasonable to expect the Intel M3-toting Pro to cost $100 more (though Samsung had nothing to announce on that front yet). That puts this computer into a place that few Chromebooks have ever seen. The closest comparison is probably HP's Chromebook 13, which starts at $500 and goes up significantly from there. But Samsung's new Chromebooks appear to have more solid construction, are lighter and -- most importantly -- are ready for Google Play, which will significantly expand the functionality of Chrome OS. 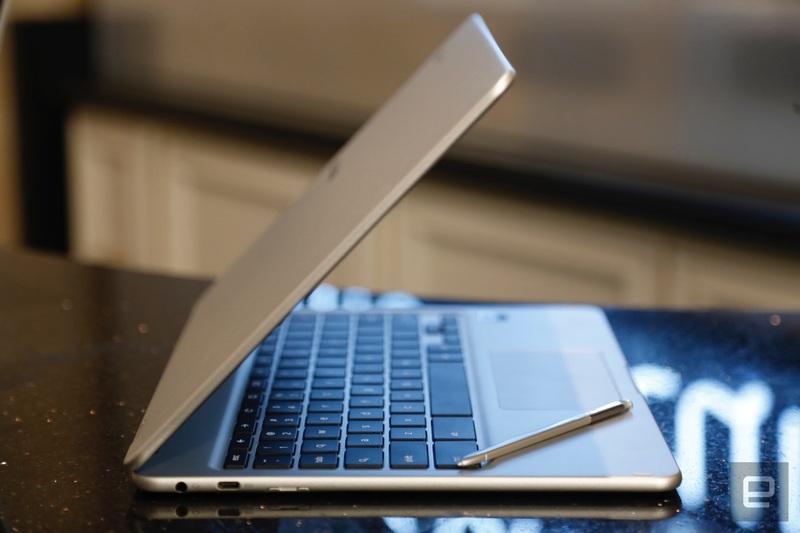 Google says it remains committed to the Chromebook Pixel line, but until it releases another model in that lineup, it's fair to say that Samsung's Chromebook Pro has assumed the mantle of everything a Chromebook can be in 2017. Of course, we'll need to give it a thorough review to make sure it delivers on that promise. Click here to catch up on the latest news from CES 2017. Nathan is the deputy managing editor at Engadget, keeping track of the site's daily news operations and covering Google, Apple, gaming, apps and weird internet culture. He now lives in Philadelphia after stints in Boston and San Francisco. Marcus Hutchins was a hero for stopping WannaCry, but created Kronos years earlier. The icons let people know what data and information is being collected around them.